According to an embodiment of the invention, a data controller comprises a traffic pattern collector to observe a data traffic pattern, the data traffic being comprised of data packets; a traffic service engine to receive data from the traffic controller concerning the data traffic pattern and to determine a data flow specification for the data traffic pattern, the received data including the size and arrival time of each of the data packets; and a quality of service provider to receive the data flow specification. The data flow specification is the minimum data flow specification data flow specification that will allow each of the data packets to be transferred by the traffic controller within a delay upper bound. 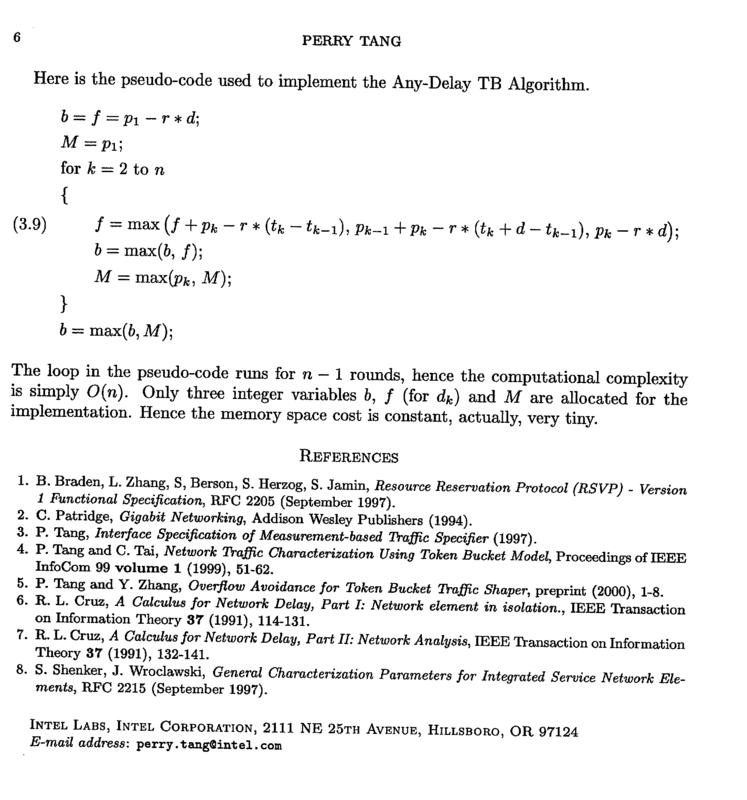 According to one embodiment, the minimum data flow specification for the data traffic pattern is determined according to an algorithm known as the Any-Delay TB Algorithm. FIG. 1 illustrates a token bucket model that may be utilized in connection with an embodiment of the invention. In this illustration, a transmitting device  105 is transmitting data to a receiving device 115 over a communication path 110. The transmitting device 105 and receiving device 115 may be any device or system in a computer network, including any network server, switch, router, client system, or other device or system. The data is transmitted in the form of data packets, with the data packets being of varying sizes and arriving at various times. 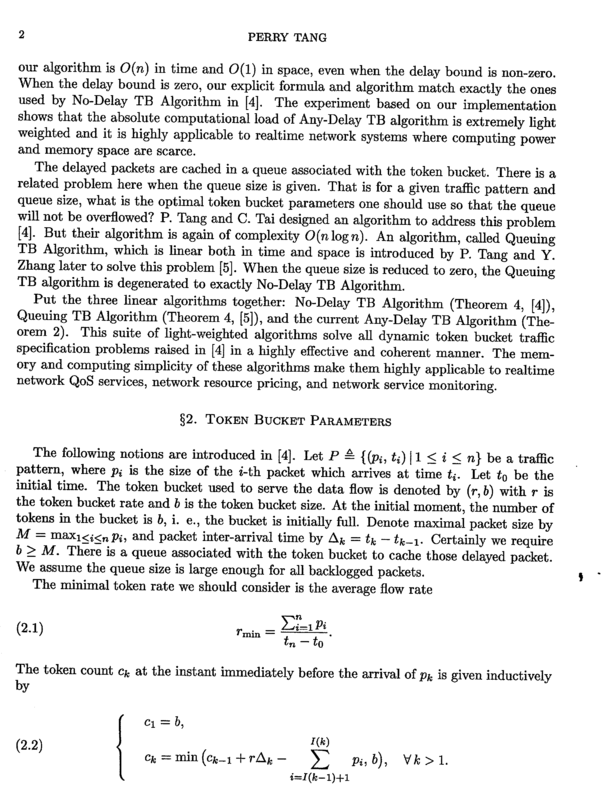 The data packets shown in FIG. 1 are a first data packet 120 of size p1 and arriving at time t1, a second data packet 125 of size p2 and arriving at time t2, a third data packet 130 of size p3 and arriving at time t3, and a fourth data packet 135 of size p4 and arriving at time t4. As shown in FIG. 1, the variance in the size and arrival time of the data packets results in certain time periods with little activity and certain time periods with “bursts” of data. The data packets are processed through a flow controller utilizing a scheduling counter, which may be illustrated symbolically as a token bucket  140. In this illustration, the token bucket 140 receives tokens periodically from a token generator 145. The token bucket controller regulates the flow of data. The token bucket controller allows certain bursts of data, such as represented in FIG. 1 by the second data packet 125, the third data packet 130, and the fourth data packet 135 arriving in close sequence, but the system limits how large the bursts of data traffic can be. The level of data flow is regulated by the tokens. For each particular number of bytes released to the network, one token is used and removed from token bucket 140. Under a particular embodiment, one token is required for each byte of data that is released. A token generation rate r represents the number of tokens that are generated per unit of time. The token bucket 140 can hold a certain maximum number of tokens b, the token bucket capacity. According to the illustration shown in FIG. 1, a data packet that has arrived will be released when there are sufficient tokens in the token bucket for the number of bytes contained in the data packet. If there are not sufficient tokens available at a particular time to release a data packet, the data packet is held, or stored in a queue  150, until token generator 145 generates sufficient tokens for token bucket 140 to allow transmission. Under a particular embodiment, the token bucket 140 includes parameters (r, b), where r is the token bucket rate and b is the token bucket size. Under an embodiment of the invention, the queue 150 that is utilized for a token bucket is sufficiently large to hold any backlogged data packets. The traffic pattern that is observed will have a certain maximum size of a data packet, which may be denoted as m.
Under an embodiment of the invention, token generator  145 and token bucket 140 comprise a counter that increments at a constant rate r with a maximum count of b. The counter is decremented for each data packet that is released, with, for example, the count being reduced by one for each byte that is released. If the counter is not at a sufficient count for the release of a data packet, the data packet is held in queue 150 until the counter reaches a sufficient count. However, holding a data packet in queue 150 creates a delay for the data. If there is an upper bound prescribed for data delay, there is a question regarding the minimum size required for the token bucket in order to ensure guaranteed service in which the delay upper bound is not exceeded for any data packet. FIG. 2 is a block diagram illustrating the operation of a measurement-based traffic specification system  200 under an embodiment of the invention. The system 200 may exist for any observation point in a network. In this illustration, data in the form of data packets is transferred from the preceding point in the network, designated as Point A 205, to the next point in the network, designated as Point B 210. The data traffic will flow through traffic pattern collector 215 and QoS provider 220 on to the second point 210. The traffic pattern collector 215 collects information regarding the traffic pattern and provides the information to a measurement-based traffic specification (MBTS) engine 225. The information may include the number of data packets received, the size of each data packet, and the time at which each data packet arrived at the traffic pattern collector 215. The MBTS engine  225 converts the raw information regarding the data pattern to data flow specifications. Under an embodiment of the invention, the flow specifications determined by the MBTS engine 225 are in the form of optimal token bucket parameters for the data traffic pattern. The results determined by the MBTS engine 225 are then made available to the QoS service provider 220 through a reporting mechanism 230. Note that in this description, in order to facilitate explanation, the traffic pattern collector 215, the QoS service provider 220, the MBTS engine 225, and the reporting mechanism 230 are generally discussed as if each is a single functional unit. However, the functions performed by these various elements may be consolidated and/or distributed differently than as described. For example, any function can be implemented on any number of logical or physical devices or on a single logical or physical device. FIG. 3 is a block diagram of a exemplary network architecture that may include an embodiment of the invention. FIG. 3 is intended as a simplified example, but the embodiments of the inventions may be implemented in many different environments. In FIG. 3, a network  300 is illustrated, which may include one or more servers. In this example, the network 300 is shown to include a first server 305, a second server 310, and a third server 315. The network may include one or more clients, shown in FIG. 3 as a first client 320, a second client 325, and a third client 330. In this illustration, the network devices are connected by switches 335 and 340 and by routers 345, 350, and 355. In one example, the first client 320 may request certain data. In this example, the data requested may be supplied by multiple sources, including the first server 305 and the second server 310. With data traffic control under an embodiment of the invention, data traffic in the network may be measured at any point in the network. According to an embodiment of the invention, switch 335 may sense the data traffic associated with the first server 305 and the second server 310. In particular, the amount of traffic at any time may be determined, including whether there are bursts of high traffic levels. Using the traffic data information, the data loads on the first server 305 and the second server 310 may be adjusted or balanced as necessary to, for example, insure that data traffic does not exceed an upper bound prescribed for data delay. According to an embodiment of the invention, the third server  315 may be subject to a profile when supplying data to the network, the profile including limitations on the rate of data transmission and the “burstiness” of the data traffic from the server. An observation point may be implemented at switch 340 to determine the traffic pattern characteristics. Under an embodiment of the invention, a data controller may control the traffic to insure that the required profile is maintained while insuring that guaranteed service is provided such that no data is delayed more than a certain upper bound. FIG. 4 illustrates the selection of the size parameter for a token bucket under an embodiment of the invention. According to an embodiment of the invention, a traffic pattern comprised of data packets is observed, process block  405. The first data packet is evaluated, process block 410. A first variable b and a second variable d are initially set at the size of the first data packet minus the rate of the token bucket times the delay upper bound D, process block 415. A third variable m, which ultimately will be equal to the maximum packet size in the traffic stream, is initially set at the size of the first data packet, process block 420. According to an embodiment of the invention, a series of calculations (or loop) is performed for data packets  2 through n. Beginning with the second data packet, process block 425, each such data packet is evaluated, process block 430. For each of such data packets, the variable d is set to the maximum of three numbers, process block 435. The first number is equal to the previous value of variable d plus the size of the current data packet minus the rate of the token bucket times the difference between the time of the current data packet and the time of the preceding data packet. The second number is equal to the size of the preceding data packet, plus the size of the current data packet, minus the rate of the token bucket times a number equal to the time of the current data packet plus the delay upper bound D minus the time of the last data packet. The third number is equal to the size of the current packet minus the rate of the token bucket times the delay upper bound D.
The variable b is set to the maximum of either the previous value of the variable b or the current value of the variable d, process block  440. The variable m is set to the maximum of either the size of the current data packet or the previous value of the variable m, process block 445. As m is set to the maximum of either the current data packet size or the previous maximum size, m will equal the size of the largest data packet after all data packets have been evaluated. If there are additional data packets to evaluate, process block  450, the next data packet is chosen, process block 455. After the series of calculations are performed for each of the data packets, process block 450, the token bucket size parameter b is the maximum of either the previous value of the variable b or the current value of the variable m, process block 460. Under an embodiment of the invention, the value of b determined expresses the minimum token bucket size that will satisfy the delay upper bound condition. a quality of service provider to receive the data flow specification, the data flow specification representing the minimum data flow specification that will allow each of the data packets to be transferred by the data controller within a delay upper bound. 2. The data controller of claim 1, further comprising a reporting mechanism to report the data flow specification to the quality of service provider. 3. The data controller of claim 1, wherein the data controller includes a token bucket, the data flow specification comprising a minimum token bucket size that complies with the delay upper bound. 4. The data controller of claim 3, wherein the token bucket size is based at least in part on the sizes and arrival times of the data packets. 5. The data controller of claim 4, wherein data controller considers each data packet only once in the determination of the token bucket size. 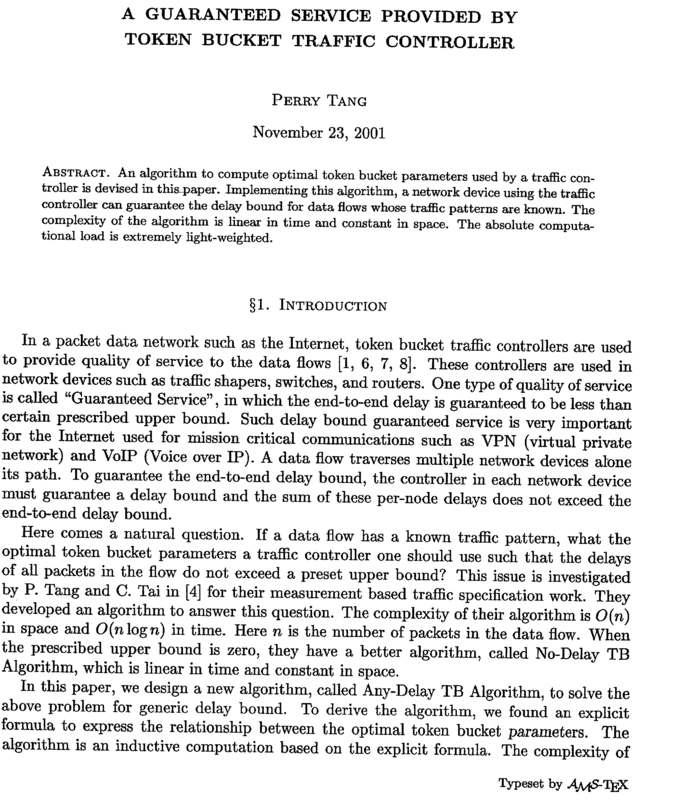 determining a traffic control parameter value based upon the information regarding the data traffic pattern, the determined parameter value being the smallest parameter value that will enable a network device to transport the data traffic without any data packet being delayed more than a delay upperbound. setting a traffic control parameter of a data traffic controller associated with the network device to the determined parameter value. 8. The method of claim 6, wherein the traffic control parameter comprises a token bucket size. 9. 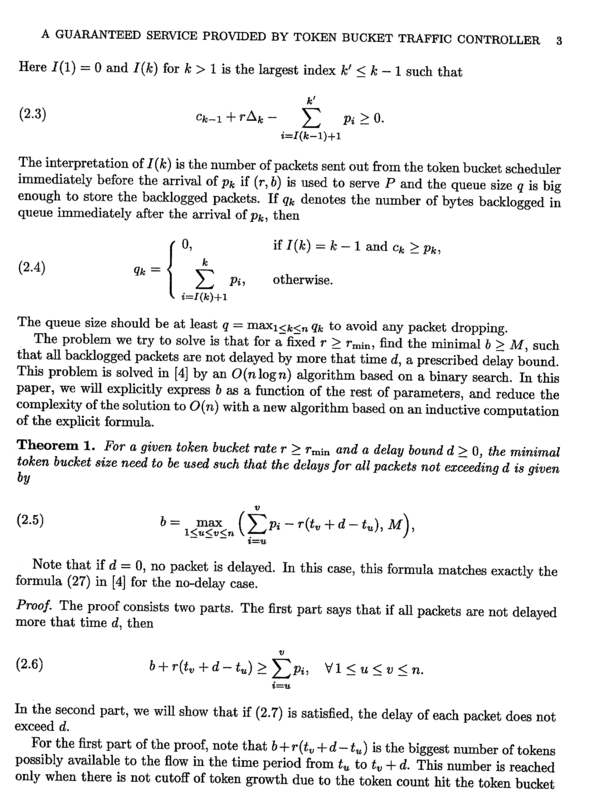 The method of claim 8, wherein calculations to determine the token bucket size are performed as data packets are observed. 10. The method of claim 9, wherein the complexity in time of the calculations to determine the token bucket size is O(n) and wherein the complexity in space of the calculations to determine the token bucket size is O(1). 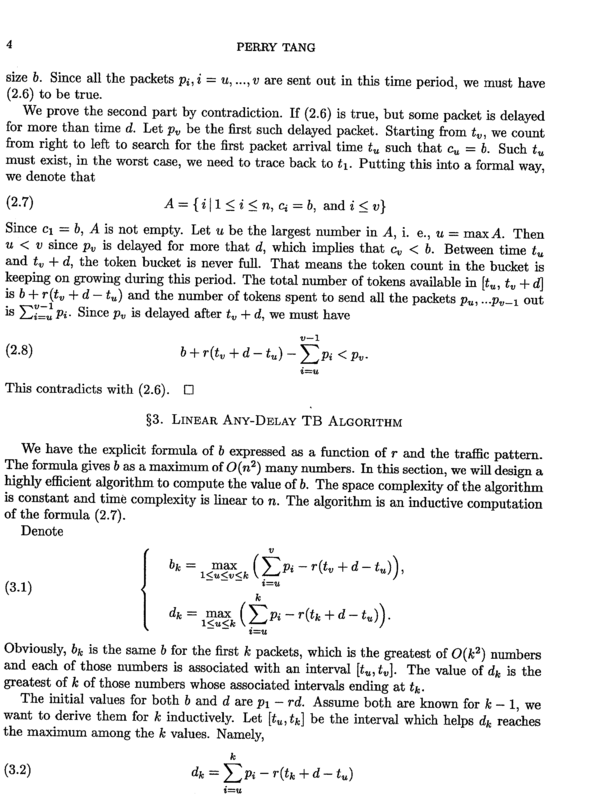 determining a traffic control parameter value based upon the information regarding the data traffic pattern, the determined parameter value being the smallest parameter value that will enable a network device to transport the data traffic without any data packet being delayed more than a delay upper bound. 13. The medium of claim 11, wherein the traffic control parameter comprises a token bucket size. 14. The medium of claim 13, wherein calculations to determine the token bucket size are performed on a real time basis. 15. 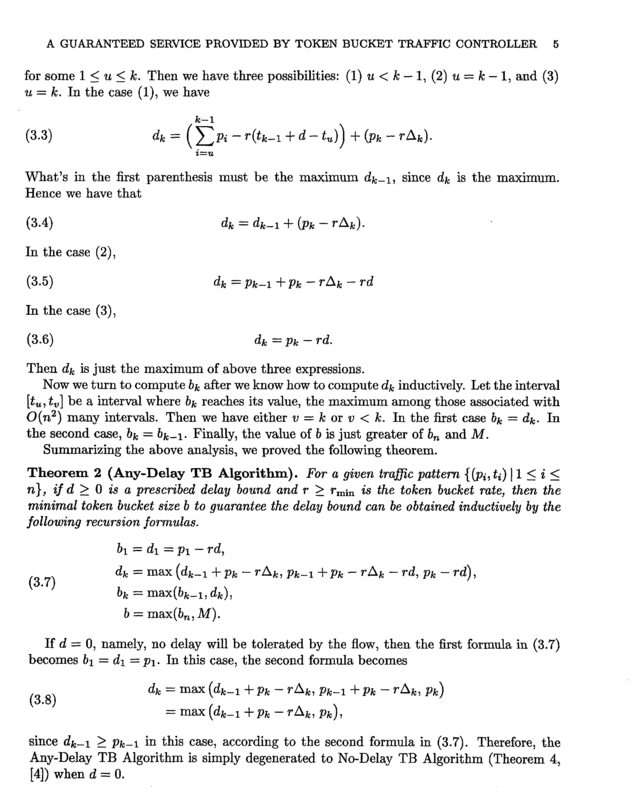 The medium of claim 14, wherein the complexity of the calculations to determine the token bucket size is linear in time and is fixed in space. 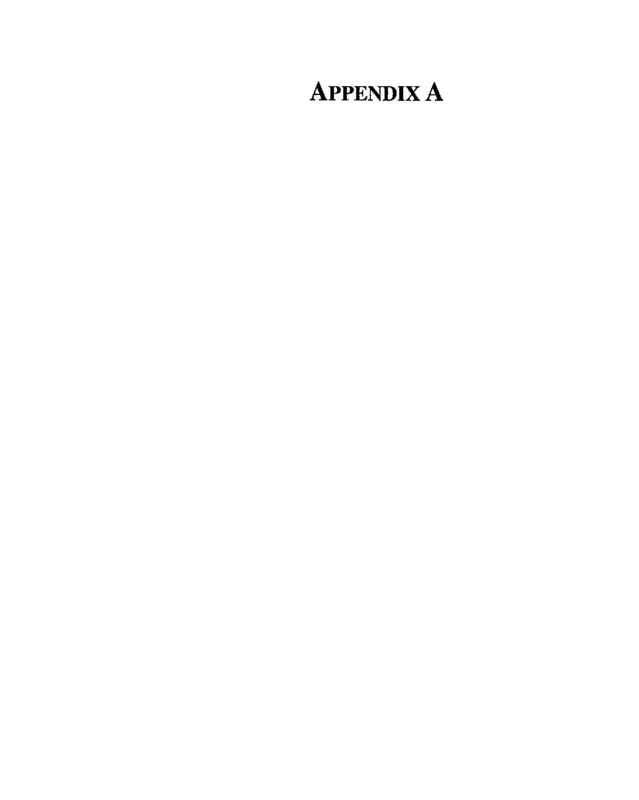 determining a size of a token bucket utilized in connection with a data traffic controller, the determined size being the minimum size that will enable the data traffic controller to transfer each data packet within a delay upper bound. d=max[d+p k −r·(t k −t k −1 ), p k−1 +p k −r·(t k +D−t k−1), p k −r·D], b=max(b,d), and m=max(p k ,m). d=max[d+p k −r·(t k −t k−1), p k−1 +p k −r·(t k +D−t k−1), p k −r·D], b=max(b,d), and m=max(p k ,m). a reporting mechanism to report the token bucket size to the quality of service provider. 23. The computer network of claim 22, wherein the token bucket size is based at least in part on the sizes and arrival times of the data packets. 24. The computer network of claim 23, wherein the data traffic controller considers each data packet only once in determining the token bucket size. a means for determining a data flow specification, the data flow specification being the minimum specification that allows each data packet to be transferred within a limit on delay. 26. The data traffic controller of claim 25, wherein the determined data flow specification comprises a token bucket size. 27. The data traffic controller of claim 26, wherein the token bucket size is based at least in part on the sizes and arrival times of the data packets. 28. The data traffic controller of claim 27, wherein the means for determining the traffic control specification includes a means for considering each data packet only once in the determination. 29. The data traffic controller of claim 28, wherein the determination of the data flow specification is performed in real time.